JP's Music Blog: CD Review: Rev. 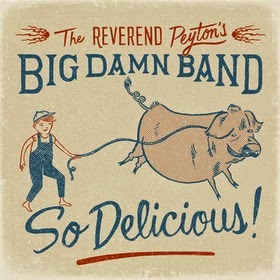 Peyton Makes His Big Damn Band Sound "So Delicious!" CD Review: Rev. Peyton Makes His Big Damn Band Sound "So Delicious!" From Brown County, Indiana comes the latest release from Rev. Peyton's Big Damn Band entitled "So Delicious!" It will be released on February 17th and crosses the boundaries of rock, blues, country and Americana music. The trio of Reverend Peyton, "Washboard" Breezy Peyton and Ben "Bird Dog" Bussell create some truly unique music that definitely demands your attention. The new eleven-song release begins with the uptempo blues rocker "Let's Jump A Train" as you find yourself singing along to the chorus. The band just wants to have fun with the playful lyrics of "Pot Roast And Kisses" as the music becomes so addictive. They journey into the pure blues romp of "Dirt," before taking on the energetic punk-like country of "Raise A Little Hell." The trio pick up the tempo even more with the jugband feel of the furious "Front Porch Trained," before slowing things down for the acoustic "Picking Paw Paws" and "You're Not Rich." The album closes with the quicken pulse of "Music And Friends" as the Brown Country All-Star Coir joins in the fun. Reverend Peyton's Big Damn Band are hitting the road in February. For a complete list of dates and for more information on their new album "So Delicious," please visit bigdamnband.com.